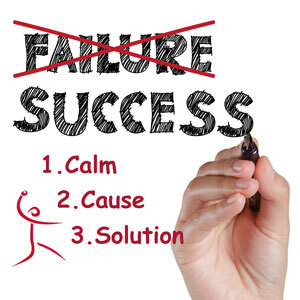 Stay Calm – trust your ability to solve the problem and to do that, you need to stay calm. It’s easy to panic, but no doubt lots of people around you will be doing that so leave the panicking to others while you stay calm and focus on the Cause of the problem and more importantly, the solution. Another thing that calm does is allow your knowledge and skills to connect to create the solution. Panic turns off your brains ability to figure out a solution, so stay calm and think solution! Figure Out the Cause – figure out what’s causing the problem you’re seeing. While this might sound obvious, or even negative, in order to find the right solution, you’ve first got to correctly identify the specific problem. “That pitch was horrible” is not a cause. It might be a description but what you need is the cause – what is actually causing the “horrible”? Give the Solution Your Best Effort – figure out what you need to do to solve the problem, and then give the solution your best effort! A careful effort means you don’t really trust your skills to solve the problem. A careful effort means you’re cheating yourself, so trust your skills by giving the solution your best effort!